"Amendment 14 to B.A.I. Order 211, revised." rendered into lard, rendered pork fat, or tallow as prescribed by Part 15 [Reg. as to temperature and time specified in section 15.1 [Reg. 15, sec. 11.
approved by the Chief of Bureau. omitted from labels applied to metal containers on which such number is. 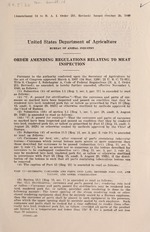 an approved wrapper bearing the inspection legend and establishment number. been approved by the Department. (9). Paragraph (8), subsection (b), of section 17.22 [Reg. 17, sec. 7, par. fat other than leaf fat. (10)) Subsection (g) of section 17.28 [Reg. 17, sec. 9, par. 7] is revoked. of lettering as the name of the product, the statement "oleo stearin added,"
name of the product, the statement "hardened rendered pork fat added." true name of the product also on the side at the time of filling. one of the statements as follows: "Artificially colored" or "casing colored." (14) Paragraph (2), subsection (a), of section 18.1 [Reg. 18, sec. 1, par. it in a manner prescribed by the Chief of Bureau. it shall be passed for human food; otherwise it shall be condemned. ADone at Washington, D. C., this 26th day of October 1940.